Waters attended the University of North Texas where he played for the North Texas Mean Green football team. He started his first three years at tight end, while recording 86 receptions for 975 yards and nine touchdowns. As a senior, he was moved to defensive end, but also played as a backup fullback and tight end. On defense, he had 45 tackles (32 solo) and 5 sacks. Waters announced his retirement from professional football on September 2, 2014. ^ "Waxahachie, Texas". City-Data.com. Retrieved 5 June 2014. ^ "Report: Patriots Sign Guard Brian Waters". CBS. September 4, 2011. Retrieved 2012-02-05. ^ Forsberg, Chris (January 11, 2012). "Waters wants taste of postseason success". ESPN.com. Retrieved 2012-02-05. ^ a b "Patriots - Chiefs: Weekend Scout Report". Scout.com. November 22, 2004. Retrieved 2012-02-05. ^ "Chiefs Look to Boss Colts". sportinglife.com. October 28, 2004. Retrieved 2012-02-05. ^ Cluff, Chris (October 31, 2004). "Notebook: Chargers' Chatman has people talking". Seattle Times. Retrieved 2012-02-05. ^ "Wilson: Brian Waters named NFL Man of the Year". National Football Post. Archived from the original on 2011-07-21. Retrieved 2011-10-22. 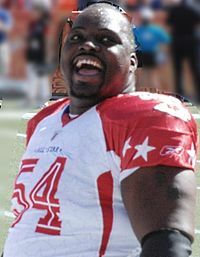 ^ "news: Patriots agree to terms with veteran Pro Bowl G Waters". Nfl.com. Retrieved 2011-10-22. ^ "Super Bowl XLVI - New York Giants vs. New England Patriots - February 5th, 2012". Pro-Football-Reference.com. Retrieved 2017-12-06. ^ Rosenthal, Gregg (2013-04-30). "Brian Waters released by New England Patriots". National Football League. Retrieved 2013-04-30. ^ Rosenthal, Gregg (2014-09-02). "Brian Waters retires after 13 seasons in NFL". National Football League. Retrieved 2014-09-02.